Every organization has access to an avalanche of data. Whether that data is from the Worldwide Web, the Internet of Things (IoT) or the networking of legacy enterprise computing, humans and machines together are creating massive amounts of data. Yet, data obtains value only when it can be analyzed and transformed into rich insights. And that is where AI shines. AI enables reasoning at a semantic level about individual situations, and enables driving actions in individual operating contexts. Extracting semantic insights from infinite pools of data, and developing insights requires complex modeling processes, often layering algorithms on top of algorithms. Actions in particular, occurring at a specific time at a specific place within a specific context, require deep understanding of that context, and often need to be executed within milliseconds. 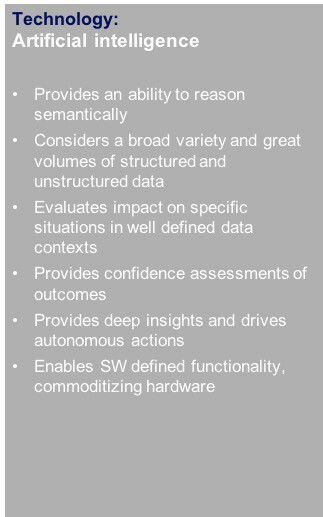 Considering a broad variety and huge volumes of structured and unstructured data, AI interprets them at a semantic level. It breaks them down into strings of potential meaning, and continuously assesses their fit to each other. Rather than just providing a single answer, AI can evaluate multiple hypotheses about a situation and rank them according to confidence scores developed through training. As AI systems observe how their conclusions fit with reality, they continue to learn, improving their accuracy. With increasing confidence, we can use insights from AI to directly drive actions and processes, rather than just give advice to humans. As operational details are increasingly be delegated to AI, processes can be automated. This leaves humans free to set high-level objectives, and monitor outcomes. However, this AI r/evolution isn’t just about responding to situations. It promises to reshape entire industries. Electronics industry executives are recognizing the importance of AI, and the potential for great impacts. This is reflected in answers we see in the recent IBM C-suite study, where 34% were likely to invest in AI but many are beginning to understand the potential benefits: 41% of respondents said AI is likely to have a significant impact on their competitive position in the next two-three years where only 19% found that true today. 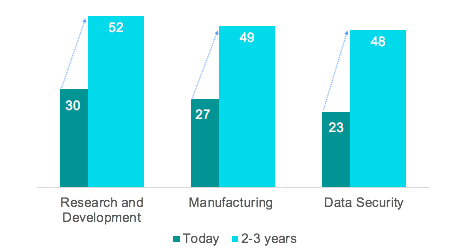 Looking from the outside in, three areas where electronics executives expected to see the most dramatic changes include R&D, Manufacturing and Security. It’s not surprising that executives see AI as helpful in three mission critical areas of their businesses. The ability of AI to model from hypotheses and test an exponential number of combinations to find solutions is beneficial in these areas, where electronics organizational investments tends to be heavy. 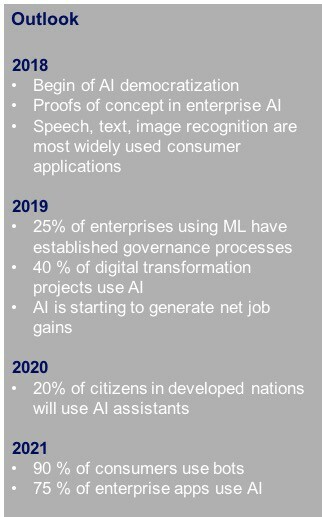 From the inside out, when executives are asked where they intend to apply AI in the next 2-3 years, they take a slightly different view (see figure 4). Take the importance of forecasting. The ability to bring evidence to a broad decision framework isn’t a task for traditional predictive analysis. Considering multiple contexts and outcomes has significant value. Enhancing work force capabilities from hiring the right people to assisting professionals by removing tedious rote activities, AI can dramatically increase productivity. While it takes executives time to adjust their decision making to rely on data driven insights, this competency is now recognized as critical in any data-rich enterprise. 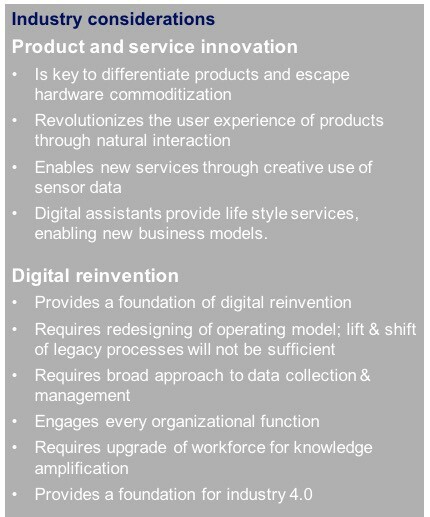 The AI revolution creates opportunities and potential disruptions for electronics companies in two ways: through product and service innovations, and through digital reinvention of their operations. Software-defined functionality is key to rapid service development and deployment but it can simultaneously commoditize hardware to the point where key product benefits may be obscured. Software-based control of electronic devices has been in the market place for the last decade or so. AI supercharges this trend and expands it to enable smart software-defined device functions, especially embedded AI. For example, security cameras can recognize people and objects, and then correlate events to identify potentially dangerous activities. Using AI becomes a key opportunity for electronics companies to escape hardware commoditization. At the same time, AI can increase the functional scope of devices by hiding the complexity resulting from the introduction of new technology. For instance, it may be difficult for the average cook to decide how to use the advanced capabilities of a range that can use a combination of radiation, convection, microwaves, and steam to achieve a perfect result. AI can translate recipes into operating instructions for such a range. It’s possible now for an oven to recognize an image of specific food and program itself accordingly. With the operational details hidden, users can focus on the purpose of devices. As an example, point-and-shoot photography has come such a long way that most of us don’t own separate cameras any more. We can take pictures with our phones, concentrating on the subjects and not on the camera. This change to functions that concentrate on outcomes is not trivial. In a general way, AI makes it possible to adapt devices to their users’ needs, rather than requiring users to deal with the idiosyncrasies of the devices. Users can interact with devices through voice or gestures, or through no action at all, simply by being present. By observing them, AI can learn about the particular preferences of users, and personalize the device functions to individuals. Through software — not hardware — our devices can engage us and educate us. Learning thermostats are a great example of this development. It is important for electronics manufacturers to start from the thought of embedded AI and significant data collection from the ground up — from design. It’s vital for two reasons. One, it affords more interesting customer experience opportunities to product development teams. Two, it starts to prevent the loss of differentiation early by bringing into consideration how a device (or machine) will learn, grow and improve with use and the user. Importantly, ubiquitous cloud connectivity has enabled third parties to insert themselves between the devices and the users, taking over the user relationship. This loss of control and knowledge can put a device provider on the slippery slope of giving away differentiation. Voice control through smart speakers presents this type of risk. It’s not simply about enabling a request / response. It’s about understanding users’ needs, speech patterns, word choices, and intents. The richness of potential insights given away allows others to learn, possibly to the detriment of the makers of the devices enabling the transaction. Digital assistants, for use in homes as well as with business applications, represent a new class of personalized services enabled by AI. Increasingly, they are being integrated directly into end-user devices, rather than only as separate devices such as smart speakers. Harnessing someone else’s AI puts data and development opportunities at risk by giving away potential knowledge to potential competitors. To exploit the opportunities AI presents for product differentiation, to expand the product scope into new areas, and to create innovative services, electronics companies must select the right hardware platform for their devices. This typically requires the use of high-powered general processing units, such as ones used in smart phones. Silicon technology advances support increased computing power at reduced battery consumption. In addition, special purpose hardware such as GPUs or neural network processors support AI functionality in devices at even further reduced consumption of electrical power. The iPhone 10 and the Samsung Round 360 camera are examples of this trend. Supporting natural interfaces, the new generation of AI based devices must integrate special sensors, from video cameras and far-field microphones to touch sensors, as well as LCDs and speakers for video and audio feedback. Integrating these additional technologies may require frequent adaptations over the entire life product life cycle (security patches, feature uploads, content). New design skills and methods are needed to use those technologies, supply chains have to be updated to procure them, and customer relations management must be enable to handle the new types of user interactions. What’s more, companies need to envision how customers will use a service in context — not simply the parameters of the feature they want to enable. Advanced electronics companies will also use AI concepts to cope with the challenge of bringing innovative products and services into a rapidly evolving market place. Leaders understand that a basic “lift and shift” of today’s business processes will not be sufficient to thrive in this new business environment of tomorrow. This is especially true while AI and industry transformations evolve simultaneously. Automating old processes generally leads to irrelevant or incorrect answers. As data is the foundation for all AI technologies, it is imperative that companies develop a comprehensive data strategy covering all aspects of their business operations. 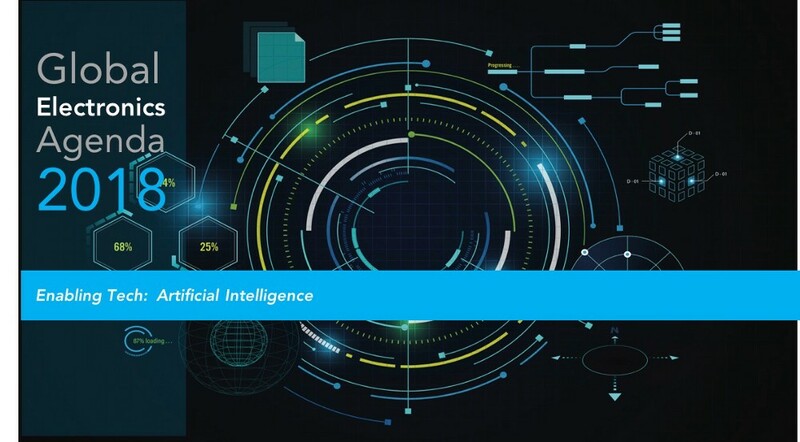 However, simply owning the data is only the start on the road to success: the real value of AI arises from the analytics that typically use company internal data as well as publicly available data to obtain new insights. This requires rethinking of business processes and building sophisticated models to evaluate a broad range of hypotheses. This often leads to restructuring of business processes, or even adapting entire value chains. Once these decisions have been made, AI models can help to guide operations, and for ongoing adaptation for evolving business environments. This development is accelerating. By 2019, 40 % of digital transformation projects are expected to use AI, and 25% of enterprises using machine learning are expected to have established specific governance processes. The transition to an agile company exploiting AI requires a workforce with the right skills. In addition to analytic skills, deep industry expertise as well as innovative agile management techniques are the foundation for success. It is important to remember that AI does not replace human expertise and judgment but amplifies it. The increasing differentiation of technologies and components is leading to specialization in the market place, where companies focus on their core competencies and obtain the non-core aspects of their business from their ecosystem. New companies emerge: potential suppliers, partners, or competitors. In particular, the rapid evolution of devices, and the continuing business model evolution require a careful board-level focus on emerging ecosystems, to manage both collaboration and competition. The intersection of data, AI and cloud services creates a challenging, yet opportunity rich environment for those willing to begin.